We at Good Street are excited to be releasing the debut EP from soundcloud.com/chimping . A standard name on the Leeds club scene, he mixes a wide range of 160-170bpm music, stealing influence from jungle/grime/tribal/footwork and mashing it into bass weight bootyshaking dance floor killers. Monkey Bizznizz shows off Chimpings many talents. 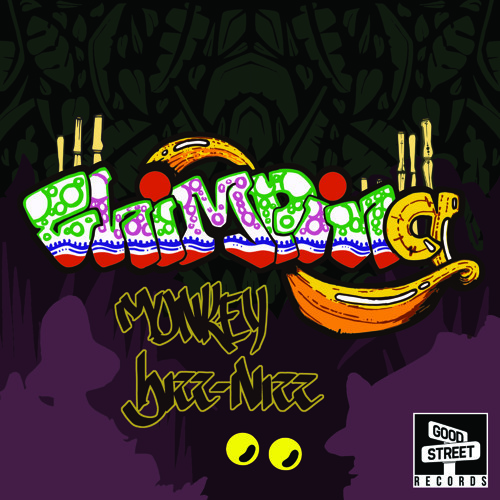 Chimping collabs with Leeds based soundcloud.com/juniormac on two of the tracks (Northern Lights + Summerfruit Riddim) and employs the vocal talents of soundcloud.com/ladymarz on Amental Foo Twerk. Sheffield based artist SOLO produced the artwork. Hard Footwork rhythms, chopped breaks, big bass and an underlying Ragga vibe, this release will be blowing up soundsystems everywhere.